F1 Grand-Prix, Rogers Cup, the Montreal Alouettest and Hockey team all have one thing in common...they are the "Hottest" sports and we are here to offer you the city's best Limousine Montreal service. During these events, the city is packed with fans, and what better time to pick a reliable limo rental company that can provide you with excellent services that you can count on. Our company has the "best of the best" F1 Grand Prix party limos and buses, corporate style limos, exotic limos, stretch limos, all available to match your style. Fast rental service. Renting with us a limo is as easy as a phone call away, no hassle, no complications, all you have to do is call us and our impeccable customer service will pick up the phone and secure your rental worry and stress free. No matter what the group size you have, we will find you a limo to meet your group. Affordable and flexible. Our prices are the most competitive and affordable in the industry. Call us and you will find out our amazing packages. Party in style after the game. So when the game finishes, you and your friends might hit the town for a party, a bar or a cruise in town. This is something that we can cater to and advise on where the most desirable places are after a game. Hassle free parking. Parking in a game event is everyone's worst nightmare. Our experienced drivers will drop you off, pick you up after the game and drive you around guaranteed not to miss your game nor wait a moment than should be. Limo to back you up. Drink your night away when you rent one of our limos as you wont have to worry about drinking limits especially that its .05. We have your back! Out of town. We love out of towners, we offer the best out of town site seeing tours and partying advice, ask about our different packages when you call us. Top notch service. Our main focus with our customers is service and their satisfaction. If your not happy, we are not, thats why with us, each and every client is treated special and with utmost thoughtfulness. You are very important to us. 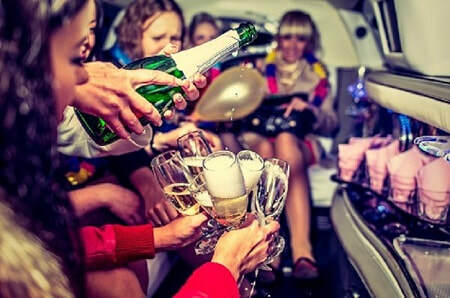 We have a large fleet of limousines, including party buses and exotic cars. Finding the one that matches your personality and style will not be an issue. Our Montreal limousine services are available at your disposable at whatever time you desire. Call us at anytime we are available 24/7 to answer any questions you have.